Sometimes I wonder why do I do this. 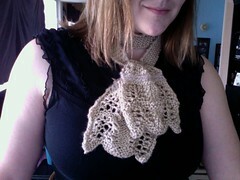 I've knitted this particular pattern before, and I found it to be quite arduous. (You can find it at Tart Hat )All though increases and decreases tend to run together. I originally knitted a 0-3 mo version. My little girl is now growing out of it, so I decided to go up to the 6-9 month. Well, last night while knitting the fifth bobble round, I look closely at the hat. It looks a bit big to me. So I tentatively put it on with yarn and needles together. OMG! It fits my head! I don't know if it's because the yarn is so stretchy or what, but it fits me. The first one came out almost too small, now this one seems so large. How weird? Anyway, I've also started knitting my first garment. The Intolerable Cruelty from knitty as well. I usually don't knit clothing because I feel like it's somewhat a waste of my time. All that work for something you wear so little. But I love this skirt. It's unique! So far I only have about 4 inches done, but it's a start. I was in search of inspiration! I ran across this interesting piece online and had to do it. I've been trying to find ways of incorporating my love of knitting into everyday clothing without being a scarf or sweater. Surprisingly, this came out so well, I'm planning on making another in a different color! It started out a little confusing with the increases and deceases. I had printed the pattern and didn't put the proper indentations where they needed. So after 6 rows in I realized I had screwed up and pulled the whole thing to start again. Another funny thing is that after I had it finished and posted it on Ravelry, I noticed that no one else's wrapped around their neck like mine did. My mistake? Who cares?! It looks and feels great! With the next one I plan to make, it will be red with a maroon stripe and a whole lot shorter to wrap and tie. I just need some more summer wearing patterns to work on! These turned out fantastic!I found the pattern (again) on Ravelry.com. It linked me up to Hand Like A Hole . Once again, they were more simple than I thought. 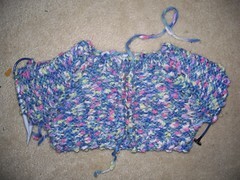 They are, in short, a garter stitch rectangle with a half row of increases in the middle (YO's). I love the way they look using the finer lace weight yarn. I had to change the pattern a bit to accommodate, but it was worth it. 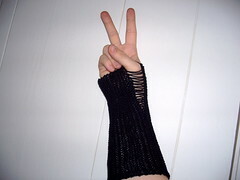 I have a dear friend who wears a lot of Goth clothing, so I'm planning on making her a pair for Christmas. I feel like I'm on yarn withdrawal. I haven't been to the Yarn store (LByarnco.com) in a couple of weeks, and I've had to make due with what I can get at Walmart (which is not a whole lot). I keep battling with the idea of opening my own yarn store her in my home town. I would be 70 miles away from the nearest one being in Tulsa and Norman. I am unsure about putting such a huge amount of effort and time into something that might not work. I plan on talking to some people here in town to see what they think. It would be a BIG risk. I guess I'll just have to contemplate it for a bit. I bought this yarn months ago at Walmart for only a dollar a skein. I've been looking out for the perfect pattern to show off it's unique attributes. It has so much character by itself that I didn't want a showy pattern with a lot of pattern. 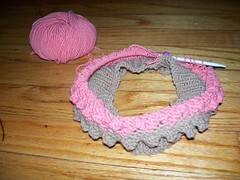 It was by luck that I went onto Ravelry.com and actually looked up project that others had done using the yarn. Lo and behold, there it was! The perfect pattern! I immediately picked up my needles and started working. In one evening I had a perfect caplet for my little girl when she gets older. It goes to show you how a pattern can be affected by what yarn you use. I won't look at pattern the same way again. For more information on this pattern, please look at http://www.peonyknits.blogspot.com/. It's going to majorly snow today, so I plan on staying in and knitting. Oh darn! I just have to figure out what. I plan on making an afghan for my brother and sister-in-law. I'll probably start that. I've bought a mish-mash of yarn to give it an eclectic look, but they are all in the vanilla family. I almost want to keep it myself! Good day to all! I have one completely done, but when I started on the next, the kids took over my time. If only we could knit all the time! This is interesting. 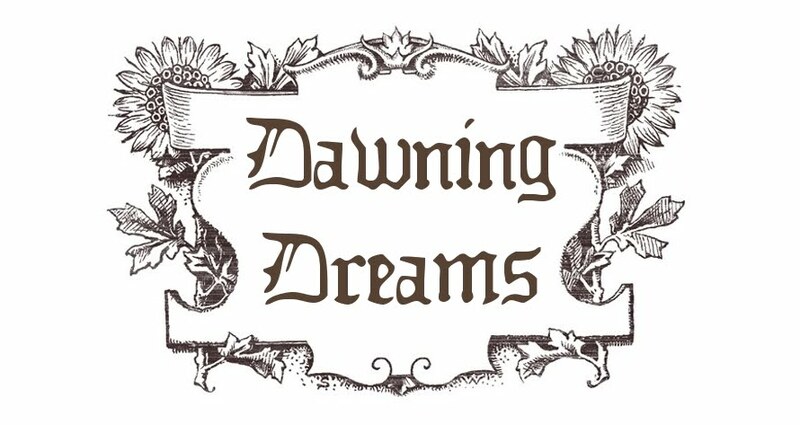 Seeing as how I have had a blog going before, I have never dedicated one to such a specific topic. However, in this case I feel it is needed. I learned to knit via a friend at her newly opened yarn store. I was instantly hooked. It seems that in a few short months I've tackled odd patterns, new knitting techniques, and the wonderful world of knitting lingo and have come out unscathed. Now I just need to keep track of everything. So here it goes! Cheers to keeping projects in order and the fun continuing.